As can be seen, the proportion of 3-year and above ice has steadily increased since 2009. Also, both 4 and 5-year ice have risen since 2011 and 2012 respectively. 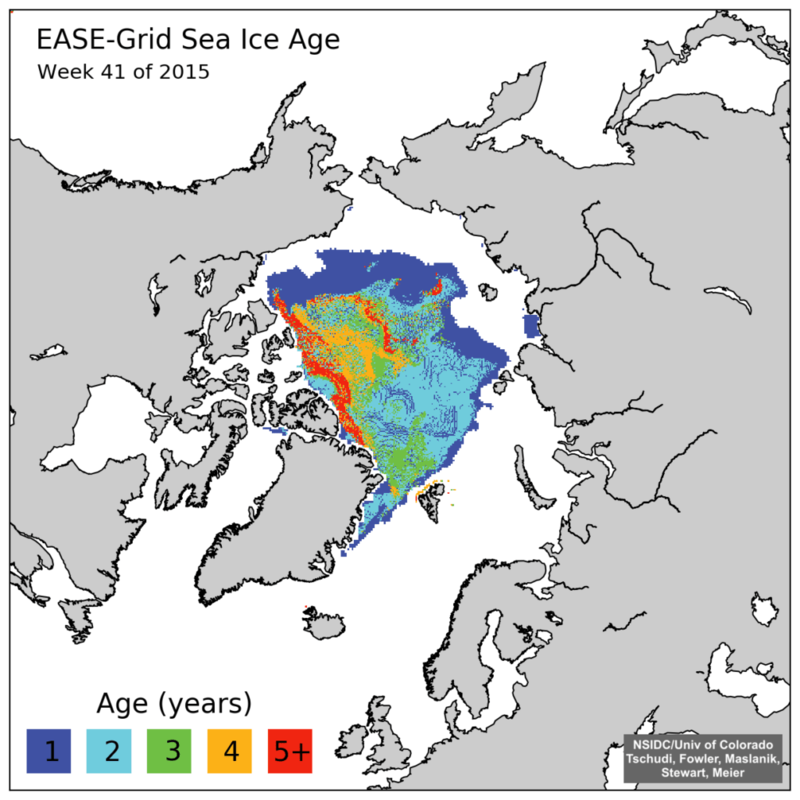 This is natural, since an increase in 3-year ice in 2010 will turn into 4-year ice the following year, and so on. Yet now, in their latest monthly report, NSIDC show a totally different picture. To confuse matters, the chart is tipped upside down, but the amount of 1 and 2-year ice is broadly the same now as in 2009, again for week 11. With a slightly lower total extent, this would imply that the percentage of this younger ice has actually increased. These are for week 41 last year, ie October. The old NSIDC style graph, which they have used for years, shows a mass of 5-year ice across the Canadian archipelago and the north of Greenland. Look closely, and you will notice that the area of 5-year ice has noticeably shrunk, particularly that tongue to the north of Greenland. I would recommend reading both Tony’s posts, here and here, as they give the full story. Disgracefully, NSIDC have now deleted the archives for all of the older style maps. They have also given no explanation, as far as I am aware, of why they have revised their historical data so significantly. It is worth pointing out though that the old style sea ice age chart, which I have shown above, was always published in the March or April review each year. But last year, it never appeared – they eventually sent me a copy, following my request, along with some sad little excuse. My suspicion at the time, which has now been borne out, was that a chart showing increasing multi-year ice was not compatible with the official line of rapidly disappearing ice. It therefore seems that, in good old climate science tradition, they have simply adjusted the inconvenient data. Just like NOAA and GISS, it is evident that we can no longer trust anything coming out of NSIDC. Obviously, it’s a TOB (time of observation bias) correction? Or, the station height moved? Seems that another Congressional investigation would be in order. They tried that recently when NOAA tried to make “the pause” disappear and refused to honor the congressional subpoena of their internal communications concerning the matter and is still stalling. This of course is of course BS. They are all government employees paid by the tax payer and thus have no legal standing to make such a claim. But with the current administration there is little that can be done about it. Of course the NOAA position was backed by the usual suspects. I think that Broadlands must be on the right track. Perhaps they interpolated the multiyear ice data based on observations done off the coast of San Diego. Another good catch by Tony H.
Thanks for extending its audience. NSIDC guilty of dodgy behaviour? Just the nature of the beast surely?! Thanks go to all those who flag it up including yourself Paul. The Ministry of Truth strikes again. History is what we say if is. I also note that NSIDC have been very careful to ensure that there is no record pof their previous versions at the Wayback Machine. Heller fortunately has them all archived. Wayback was blocked by a robot.txt. He who hides something has something to hide. NOAA/NCDC has been adjusting their data for years. Almost all of the older temperatures have been systematically lowered, with a seasonal “flavor” through several versions described as “improvements”. The winter temps tend to be lowered the most, the summer temps the least. All 48 states. Only California has had their temperatures rise. Their maps have been changed as well. Very difficult to do any historical studies as the proverbial “pea” keeps moving under the “shells”. Proof of their lies comes with ZERO engagement with the likes of Tony Heller. Under ‘normal’ circumstances his allegations – if untrue, amount to professional libel and would certainly result in a lawsuit from any serious organisation keen to protect its good name and reputation. No such ‘suit ever comes Tony’s way, because they’d have to defend their case – and data, in an open court, and that’s the LAST thing they want to do. I am beginning to think that the tactics of NOAA and its affiliate NSIDC in adjusting and obscuring data are having a negative effect on their political and financial masters in Washington. These latter must by now be well aware of the criticisms of their “adjustments” and might actually be causing the political establishment to reconsider the action needed to slow down or stop global warming . You see the only sensible action to prevent GW , given that the basic science has been acknowledged for more than the last 40 years , is to ban or severely restrict the use of fossil fuels . In 40 years none of the world’s leaders have finally signed off such a treaty. In the past when global problems arose , eg atmospheric nuclear tests and ozone destruction by CFCs (as it was perceived to be ) , banning treaties were agreed in a relatively short time, but 40 years on , no such total and instant ban has been agreed by everyone on the use of fossil fuels in order to prevent escalation of global warming. It could be argued in this particular case (of GW) the cure would be worse than the disease and that is the reason why the world’s leaders are constantly kicking the problem down the road . No doubt that is part of the reason . However could it also be that the apparent lack of transparency by the Govt agencies and the constant criticism of bad faith on their part is causing successive presidents and their advisors to have doubts about endangering the whole of the US , and world , economy on the say of a small group of scientists whose behaviour appears to be questionable. Which news agency is going to pick this up & report ………………. ! This comes today straight from the horse’s mouth (so to speak) perhaps proving that there’s nothing like a pair of eyes on the ground (OK water) that tells it like it really is.